Click the File tab to get to the backstage. Click Options, and select the Advanced tab. Scroll down to the Cross-Project Linking Options for This Project section. The first two settings, Show External Successors and Show External Predecessors, determine whether ghost predecessors and successors are displayed as tasks or hidden in the current project. This setting doesn't affect the predecessor and successor fields of the linked internal task, which show the external links as text. If you insert the parent project of an external task into the active project, then the external task isn't displayed as a ghost task but is instead displayed like any other task in an inserted project. If you select the Show 'Links Between Projects' Dialog Box on Open option, then the Automatically Accept New External Data option is disabled and unchecked. If Show 'Links Between Projects' Dialog Box on Open isn't selected, then the Automatically Accept New External Data option is enabled and can be turned on or off. If the Show 'Links Between Projects' Dialog Box on Open setting is selected, then Project displays the Links Between Projects dialog box whenever the file is opened, but only if there has been a change to an external task or link. If this setting is deselected, then Project doesn't display the dialog box on file open even if changes have been made to the external tasks or links. In that case, you can display the dialog box at any time by going to Project tab => Properties group and clicking Links Between Projects. If Automatically Accept New External Data is selected, then Project automatically accepts any new external link information without prompting you. If Project can't find the external link (because the link was removed or the project file was moved), then the external task is deleted. If Class One Project is already open in memory, then the linked task in Class Two Project reflects the current information from Class One Project, and the ghost tasks reflect the current task data. Any open project reflects the current data of the external tasks and links. If Class One Project isn't currently open, then Project looks for the external data in the external project (which would cause the project to be loaded in the background). If this external data is different from the current data stored in the first project that's opened (Class Two Project), then Project displays the Cross-Project Links dialog box, which shows all external links. Links that have changed are shown in the Differences column. The Links Between Projects dialog box (see Figure 7) displays all the cross-project predecessors and successors for the current project, with information about what changed in the current project. This dialog box also shows links whose source project can't be found or whose source task can't be found. From this dialog box, you can repair broken links, accept or refuse new data concerning a cross-project link, and edit or delete cross-project links (and thus ghost tasks as well). 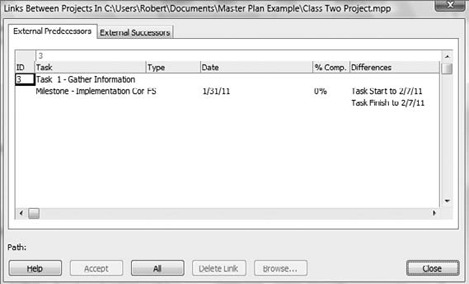 Shows the internal and ghost-task pair that constitutes a cross-project link. The internal task is aligned to the left and has an ID number. The ghost task is indented under it. Shows the link type and any lag or lead information about the external link. Either the start date or the finish date of the external task. If the link is connected to the start date of the external task, then the date is the start date. If the link is connected to the finish date of the external task, then the date is the finish date. Shows the % Complete value for the external task. Provides information about what has changed in the external task from the external project since it was last updated in the internal project, or lets you know that the external task or project file couldn't be found. If more than one piece of information changed, then the changes are listed on separate lines. The Accept button accepts all the changed information for the selected task. The All button accepts the changed information for all links in the dialog box. The Browse button lets you repair the path for an external project file that may have been moved or renamed. The Delete Link button deletes the selected cross-project link and removes the external task from the current project.